Plants are multicellular organisms in the kingdom Plantae that use photosynthesis to make their own food. There are over 300,000 species of plants; common examples of plants include grasses, trees, and shrubs. Plants have an important role in the world’s ecosystems. They produce most of the world’s oxygen, and are important in the food chain, as many organisms eat plants or eat organisms which eat plants. The study of plants is called botany. Plants are autotrophs; they produce their own food. They do so via photosynthesis, which is the process of making nutrients such as sugars from light energy and carbon dioxide. Photosynthesis occurs in cell organelles called chloroplasts, which contain chlorophyll and carotenoids, molecules that absorb light energy and change it into a usable form. Heterotrophs, on the other hand, are organisms that cannot make their own food and must eat other organisms to survive. Many heterotrophs eat plants. Other heterotrophs eat animals that have eaten plants. Plants are primary producers in many ecosystems, giving them a vital role in the survival of many other organisms. In addition, oxygen is a byproduct of photosynthesis, and many organisms depend on oxygen to survive. We couldn’t live without plants. Plants are multicellular organisms with eukaryotic cells. A eukaryotic cell is a relatively large cell with a true nucleus and other organelles that perform specific functions. Plants, protists, fungi, and animals all have eukaryotic cells. Plant cells are distinguished by their cell walls containing cellulose, chloroplasts that perform photosynthesis, and a large central vacuole that holds water and keeps the plant turgid. Prokaryotic cells, on the other hand, are small with no true nucleus or organelles except ribosomes, which produce proteins. Bacteria and archaea have prokaryotic cells. Many plants have vascular tissue, such as xylem and phloem, that carries water and nutrients throughout the plant. This is particularly important for plants that grow upwards; water needs to travel from the roots up the stem to the leaves. Vascular tissue is found in more “complex” plants. Plants are believed to have evolved from algae-like ancestors. Today, most modern-day algae are classified as bacteria, not plants. However, green algae, which also have cellulose in their cell walls and have chloroplasts that perform photosynthesis, are sometimes grouped with plants. Plants reproduce both sexually and asexually and have what is known as alternation of generations. A haploid stage alternates with a diploid stage. Haploid is when cells contain one set of chromosomes, while diploid is when cells contain two sets. (For reference, humans are diploid but their gametes—sperm and eggs—are haploid). In plants, two haploid gametes join to form a diploid zygote. This diploid zygote divides through mitosis to become a multicellular organism. It is called the sporophyte, and at maturity, it asexually produces haploid spores. 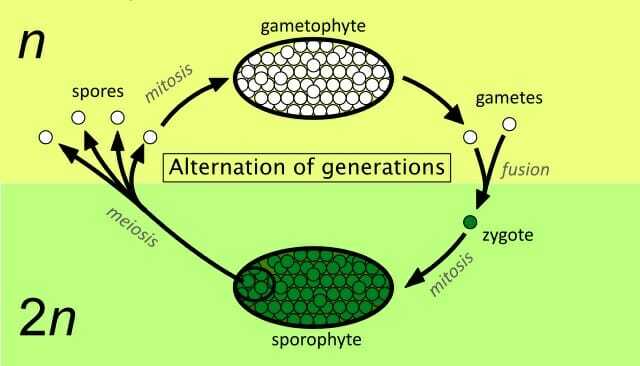 The haploid spores then germinate into multicellular organisms called gametophytes. Gametophytes produce haploid gametes, which fuse to make a diploid organism, and the alternation between diploid and haploid starts all over again. This image depicts the alternation of generations. Charophytes are complex green algae such as stoneworts. They have cells with chloroplasts, cell walls containing cellulose, and store starch, as plants do. They reproduce sexually and some have sperm with flagella (tails that allow them to move), just like some plants do. Some fossil stoneworts are very similar to modern day ones. Bryophytes are nonvascular land plants. They do not have vascular tissue, which is tissue that transports water and nutrients. They are found both on land and in water. Common examples of bryophytes are mosses, liverworts, and hornworts. Bryophytes are generally very similar to algae in their lack of a vascular system. They do have parts similar to roots, stems, and leaves, but these are not the true roots, stems, and leaves found in vascular plants. Liverworts were probably the first land plants to evolve. Hornworts have features of both algae and plants, and mosses, the most well-known bryophytes, are the members of this group that are most similar to vascular plants. Seedless vascular plants produce embryos that are not protected by seeds. Instead, they reproduce via spores. Members of this group include ferns, horsetails, quillworts, clubmosses, and spikemosses. These plants used to be called pteridophytes, but this turned out to be an inaccurate group because ferns and horsetails are more closely related to seed plants than to quillworts, clubmosses, and spikemosses. Seedless vascular plants flourished during the Devonian period and in Carboniferous forests. Gymnosperms include conifers and related plants like ginkgoes and cycads. Gymnosperms have “naked seeds”; their seeds are not contained within an ovary as in flowering plants. Instead, their seeds grow on the surface of leaves, or in the case of conifers, modified structures like cones. The most common example of a gymnosperm is probably the pine tree and its pinecones. Ginkgoes are also well known for being essentially unchanged from ancient ginkgo plants found in fossils from 270 million years ago. Angiosperms are flowering plants. They are the most widespread plants today, and over 295,000 different species are known. Their reproductive organs are flowers, which have male parts like stamen and pollen, and female parts like the pistil. When flowers are pollinated, fruits develop containing seeds. Angiosperms have more complex vascular tissue than gymnosperms do. Chloroplast – An organelle found in plant cells that contains chlorophyll; it is where photosynthesis takes place. Organelle – A specialized structure within a cell that carries out a certain function in that cell. Alternation of generations – The alternation of diploid and haploid stages in a plant’s life cycle. 1. Which is NOT a characteristic of plants? C is correct. Plants are autotrophs that make their own food. They also reproduce both sexually and asexually during the alternation of haploid and diploid generations in their life cycle. 2. The gametophyte is ______ and produces ______ during reproduction. B is correct. Gametophytes are haploid; they are multicellular organisms that grow from haploid spores. They produce haploid gametes that fuse to make a diploid organism called the sporophyte, which in turn produces haploid spores that more gametophytes will grow from. This alternation between haploid and diploid is the alternation of generations. 3. Which plant is a gymnosperm? A is correct. Pine trees are conifers, and all conifers, along with others like ginkgoes and cycads, are gymnosperms. Gymnosperms have “naked seeds” that are not contained in an ovary and instead form on the surfaces of leaves or in cones.